Ahh Twitter…. and the oft mis-understood, oversold, empty promises from Social Media Marketing Consultants. I ran into the following tweetstream (why is that a word) over the weekend. Its nothing more than variants of “[insert geography] [insert practice area] [lawyer]” repeated ad nauseam. 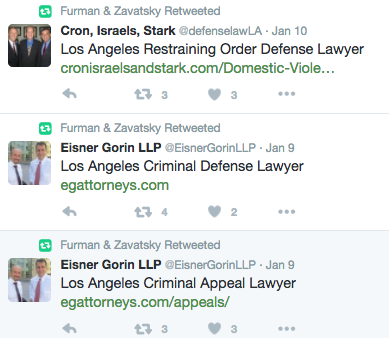 And it seems that these tweets are so interesting among a trio of CA based law firms (Eisner Gorin, Furman & Zavatsky, and Cron Isreals Stark) that they all just can’t stop themselves from retweeting and favoriting the awesomeness of each other’s mundane geo practice area marketing garbage. I added a small shot of Eisner Gorin’s Twitter account on the right so you can see just how fascinating this isn’t. Now presumably no one at any of these firms is proactively doing this. I smell the workings of a low end marketing expert with some program automagically vomiting out tweets and retweets. Perhaps there’s a report at the end of each month victoriously celebrating Social Media engagement – impressions, followers, retweets, favorites etc. And of course, none of this is going to generate an inbound phone call – in fact in the sad event the firm’s’ twitter account shows up in a branded query (a distinct possibility) after an offline referral, I suspect Joe Prospective Client is smart enough to be turned off by this pathetic ploy. And while I don’t know if this is the inner workings of some bad agency, remember…. just because your don’t understand it, doesn’t mean you should pay for it (or do it yourself). Hopefully these firms aren’t paying some SEO expert to boost their SEO rankings with this by either a)linkbuilding and/or b)build social followers. Set the record straight. Links in tweets isn’t linkbuilding. The number of twitter followers, retweeters, favorites etc. has NOTHING to do with search algos. Same goes for Facebook, Snapchat, Pinterest, Blab, Meerkat… the list goes on (and on and on. And then it keeps going some more.). If your agency tells you otherwise, at least now you know why your SEO efforts aren’t generating clients.